Learning how to make a solar oven is a great science project, is cheap, and easy. The key to making a working solar oven is to have cardboard wrapped in aluminum foil that concentrates the Sun’s rays onto the food you are cooking. It’s possible to cook using the light from the sun. You may have already known this as it is possible to harness solar power through a solar panel and use it to power an electric oven. However, it is also possible to cook using only the light from the sun itself. How is this possible? You can do this by creating a solar cooker. A solar cooker can be used to cook a variety of meals like vegetables, bread, rice, and meat. With the right implements, you can cook in a variety of fashions, including baking, steaming and frying food. You just need to set up your solar cooker the right way. Solar cookers work by capturing particles of light, photons, and generating heat with them. The electromagnetic rays emitted by the sun contain a substantial a massive amount of energy, and when these rays strike a material, they cause the molecules within that material to start vibrating. This creates kinetic energy. The transfer of kinetic energy is what creates heat. So it is possible to use the energy from the sun and use it to heat and cook something. You simply need harness this energy somehow and prevented from dissipating. The heat energy is trapped by a pot, covered with a lid. This means that the food inside is losing less heat energy and begins to cook. Think of how a car that sits in the sun with the windows rolled up will get hot over time. This is the greenhouse effect. Solar cookers use a variety of methods to trap this heat, with different forms of solar cookers cooking in different ways. Different types of solar cookers include the box cooker, the parabolic cooker, and panel cookers. Box cookers are very simple solar cookers, ones that you could make it home. They are constructed out of the box 3 to 5 feet in length and are designed to trap the heat within them. They have an open top which allows sunlight to get in, covered by some glass or clear plastic which helps trap the heat inside. They also typically have reflectors on the outside of the box to help direct sunlight into the box. The box is typically black on the inside. Using the box cooker to cook simply requires leaving the box outside in the sun, with a pot of food inside the box. The sunlight will be directed into the box with the assistance of the reflectors and it will be trapped inside the box thanks to the glass top and black bottom. The waves of light will hit the bottom of the box where they will become trapped by the material, which is why the inside of the box is typically black. Dark colors absorb heat more efficiently than light colors do. The heat that becomes trapped in the box cooks the food over time. Box cookers are capable of heating up food to approximately 300°F, or 150°C. You can safely cook and consume meat at this temperature. Parabolic cookers are another type of solar cooker, capable of reaching much higher temperatures than simple box cookers. They’re called parabolic cookers because they have a reflective parabolic device that is used to focus sunlight onto a pot or pan. The panels of the parabolic cooker are curved, which enable it to direct sunlight towards a central point. 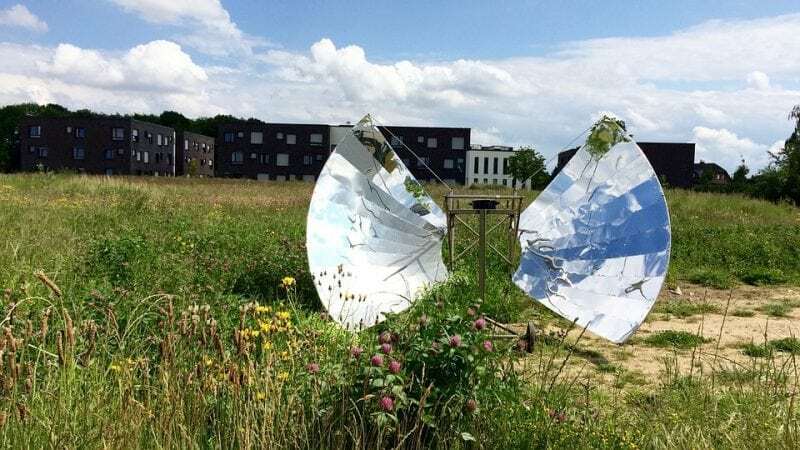 The reflective parabolic panels have to be the right size to efficiently cook food, as too large a device would generate too much heat, while too small a device would produce insufficient heat for cooking. A standard solar parabolic cooker has a diameter of approximately 5 feet or 1.5 m. The sunlight reflected by the parabolic device is focused on a region approximately 30 inches above the middle of the parabola. The pot is suspended above the bottom of the device, held where the sunlight is concentrated on. Parabolic cookers can reach approximately 400°F or 204°C. This temperature is hot enough to either bake bread or fry potatoes. Solar panel cookers (a specific device referred to as a “solar panel cooker” not cooking with the energy gathered by a solar panel) are favored by some people because they are much more portable than either parabolic or box cookers. Box cookers and parabolic cookers must be rather large to efficiently cook food, but panel cookers have the reflectors positioned above the box, meaning that the box itself can be more portable. When cooking with a panel cooker, you place the cooking pot inside of a plastic bag, which traps heat inside much like a box cooker would. You then place the bag inside of a slim, portable series of panels that direct the sunlight into the bag. Creating your own solar cooker is very easy, first find a large enough cardboard box (3 to 5 feet in length) and paint the bottom of the box black. You’ll now want to line the inside of the box with some foam insulation. Cover up the foam with tape to make sure it stays in place. Measure the flaps on the box and cut out duplicates of the flaps from a second box. Tape them to the edges of the original flaps. You want to extend the flaps of the box and double their surface area. Cover the interior of the box (except the bottom) and the flaps of the box with tinfoil. This will make it so the sunlight can reflect into the box. You’ll need to adjust the angles of the flaps to get the sunlight to reflect into the box’s interior. You can prop up the flaps of the box and angle them by using wooden barbecue skewers poked into the box. Fill in the gaps between the flaps with more cardboard and tinfoil. You can now put the pot in the bottom of the box and set it out in the sun, just remember to handle it carefully because it gets hot. If this method doesn’t work for you, there are alternate methods of creating solar cookers. Find the one that works for you. While solar cookers are useful for camping, they are also useful in developing and poor countries. Millions of people around the world still rely on the burning of biofuels to cook their food, which puts out many air pollutants and leads to the development of respiratory issues. Solar cookers are cleaner and more sustainable ways to cook food and boil water, making them cooking alternatives that save both lives and the environment.